This listing is for one dozen (12) sugar cookies. Each cookie measures approx. 3 inches. 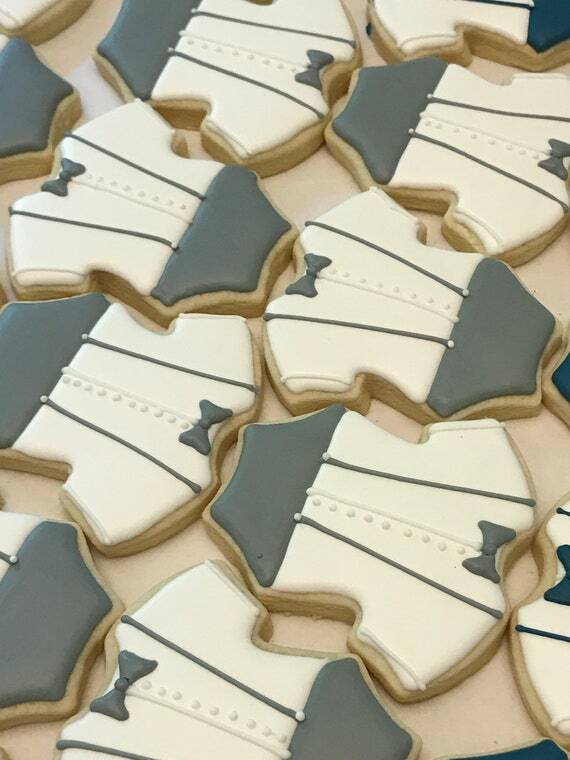 Each cookie is baked fresh and hand decorated with royal icing in our commercial kitchen with quality ingredients like King Arthur Flour and Land O'Lakes Butter. We can do custom orders - from changing your color scheme to other themes. Please message me to discuss. SHIPPING/PACKAGING: We take extreme care in packaging your cookies for safest delivery possible. Though we individually wrap each cookie in bubble wrap and surround all wrapped items with more bubble wrap, issues can arise with delivery in rare cases. We cannot be responsible for any breakage or damage that may occur during shipping. We do not have any control over items once they leave our shop. FOOD ALLERGIES: Although an allergen may not be listed in our ingredients, please note that our cookies are made in a kitchen containing known food allergens. These include, but are not limited to: wheat, eggs, milk, soy, peanuts, and tree nuts.